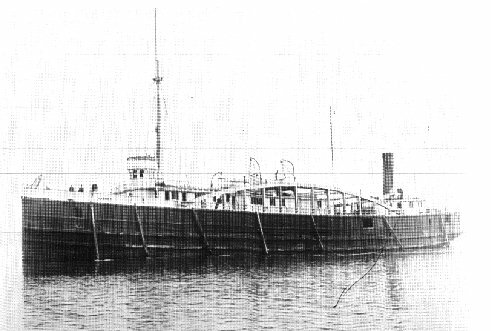 A November gale on Lake Superior forced the package freighter Wasaga, under the command of Captain W. A. Glass, to seek shelter behind the Keweenaw Peninsula in 1910. The 233-foot wooden hulled steamer joined a fleet of other vessels anchored there on the evening of November 6. At 6 a.m. the next day a fire was discovered in the ship's number one hold. Efforts to battle the fire were hampered by the still raging storm and the 18 crew members soon were forced to escape in the life boats. The crew was taken aboard the nearby steamer Westmount, which took everyone on to Fort William after the storm abated. From her decks they watched the Wasaga burn until the fire reached the waterline and the ship sank. Houghton salvager, a Captain Croze, salvaged what remained of the ship's boilers, engines and cargo. The rest of the wreck still lies in about 40 feet of water just off Copper Harbor, near the tip of the peninsula. It is a favorite visiting place for sport divers braving the cold Superior waters. It is said that remnants of the ship's cargo, consisting of clay pipe, bricks, farm machinery and rolls of barbed wire can still be found amid the charred timbers and machinery that remain of the wreck. Bottles, crockery and other relics are scattered in the area. The Wasage was 34 years old the year it burned. It was built in Buffalo in 1876 for the Union Steamship Company to replace the iron steamer Merchant, a historical vessel of its day. She was launched with the name Wissahicken, then was given her new name, Wasaga, in 1907 when sold to the Collingwood Shipping Co. of Canada.